Only had a few for the Cavalla field day, but did have a new face---Vernon Mase who qualified on the Cavalla in 1955. He was a TM and did a great job in the Aft. Torp. Room cleaning up the signal ejector. Wes Meadors was there also and he worked on cleaning up some of the signage in the control room. Bob Young brought us some paint, fluorescent bulbs, an A/C condenser and fan unit, steel, and other odds and ends. He also brought a small pump and we continued pumping the pump room bilges. Made quite a bit of progress and have the water level in the pump room down to a manageable level. wardroom shower on the Stewart. As I type this, the hole was trimmed with a torch, a steel plate was fabricated to fit flush (as opposed to an easier job of welding a patch over the top!) and welded into place. This will stop the rain from entering the Stewart wardroom. The other adult (Andy and I will get his last name for you by tomorrow) also welded a patch for the stateroom on the stbd side at the deck level. I tell you, these guys did some great work today. When Doc and I were leaving, Mark Senior was tacking a strip of metal in the shower so that the shower should be working by tomorrow! Doc finished plumbing the shower up and installed the new hot/cold/ shower fixture! We also bought a new commode and will install it Sunday. We could not today because the welding was going on directly above the commode and there needs to be some extensive scraping, painting, and a weld patch or two done before we install the crapper. In summary, a lot was done on the Stewart, but that was because we had more cadets than Cavalla Bilge rats! John Fredricks stopped by in the afternoon and he and Wesley continued the "comprehensive work list" which John wants to develop for our long range plans. Zeb brought a group of Navy related dignitaries through and was pleased with the work going on. He gave his group a tour of the Cavalla. Today, Allen Kremer GCCS, accompanied 3 Sea Cadets, Matt Swank PO1, Lewis Swetlik PO2, and Jeffrey Lewman PO3 onboard the Stewart for the second Sea Cadet drill weekend. They went right to work continuing clean up in the wardroom area getting up all the standing water in the staterooms, general clean up in the area and salvaging some mattresses from the old chiefs quarters. stateroom and one in the wardroom, but the flushing valves need to be worked on and there are some leaks which can probably be cured by new wax rings. The leaks also helped us find some of the rusted out portions of bulkheads and decks and we are looking forward to future help from the Hull Technicians to help weld patches in place. Also, a major event occurred on board the CAVALLA. Steve Harmon was inducted into ComSubRon 1 on the deck in front of the sail. Congratulations, Steve! The guestbook entries covered three pages today. Most entries are positive. If you didn't know any better, you would swear the only adjective today's kids know is "AWESOME"! Most entries are positive, but there are a few that point out some of our obvious problems-----"too much rust", "needs more care", "not enough light"....though this last one was probably a result of the loss of about half the lights in Maneuvering, and the two engine rooms. Doc and I spent some time trouble shooting that and in the process, we decided we needed to go in the lower level of maneuvering (total loss of lighting there) and particularly needed to go outboard port side. I swear that there is probably not a spot on the boat that Doc can't crawl into or fit into!! The man is a human snake! He crawled through a very small open space past the equipment to see if he could find where a cable was going. As it turned out, we found the problem and learned something----the IC switchboard on the port side has two rows of breakers on the bottom and a shore power cable which enters in the aft torpedo room is wired into some or all of those breakers. One is the supply for about half of the lights in at least the after 4 compartments. Will try to identify and label them tomorrow before any tourists arrive. Anyway, it was a good day, a lot got done and the Sea Cadets not only had a good time, but have shown some progress in getting the wardroom squared away! The parks board installed the fire extinguishers back on both the Stewart and Cavalla. They are fully charged and ready to go and the plastic covers have been ordered, I believe. There were one or two compartments that were missing an extinguisher because the bracket was either missing or broken, but the PB does have the extinguishers. I forgot to mention in my update, but there is now a smoke detector installed and functioning in the berthing area aboard Stewart. Big Thanks to Doc Beeghly for that! Doc also piped up the hot water heater to the shower, we fused it and in a few hours we had piping (no pun) hot water. We still have some work to do on the plumbing, but Doc and I have a plan which we will implement over the next few weeks. We salvaged the Red Devil Blower from one of the lower compartments and got it working which proved to be a great help when the Sea Cadets were wire brushing the deck in the wardroom. They did a great job and we got a coat of gray paint on most of the deck in the mess area there. We may not stay with the paint, but it should keep the rust from growing. We found some additional areas where we need welders....lots of rust holes through out the Stewart, but Capt. Williams of the reserve unit has authorized the Hull Technicians to drill with us too so if we can scrounge up the metal plate and the Oxy-Acetylene bottles, we should be able to make a bunch of needed repairs. Also, the father of Lewis Swetlik volunteered to come down on the next drill weekend and do some chipping and sanding and painting too! We also took the Cadets deep in the bowels of the engine rooms and machinery spaces. I think though that Jim Swank (CO of the Sea Cadets) had just as much fun touring those spaces too! Looks like a lot of people are interested in the Cavalla and Stewart and the blue info brochures are going quickly. Well, it wasn't a scheduled workday today, but you'd have never known it. Doc Beeghly, John Barnes, Richard Jenke, Ron Smith, Zeb Alford, John Fredricks, and Dave Stoops all showed up and also we had two Sea Cadets....both named Mark Sayers. (father and son) They will be spending the first overnight on the Stewart tonight and Doc was going to stay for a while after they closed the park to make sure everything went according to plan and to help out if there were any problems. Mark and Mark worked on getting the Steward wardroom squared away. They hauled quite a bit of trash out and started stripping the old tile from the deck. They got a heck of a lot done! Ephraim Dickson, from the Battleship Texas was also out in the morning to go through some of the compartments on the Stewart where some records were stored. We agreed the Stewart was not the place to keep them and Ephraim was going to inventory the documents in the engineering office. He did not get back with me, so I don't know what he recommended. He evidently had some some housekeeping as there were a few boxes of trash outside the office later on. John Barnes, in between tours, worked in the fwd torpedo room and after battery. Ron Smith worked on getting all of the personal lockers open in the after battery in preparation for painting. 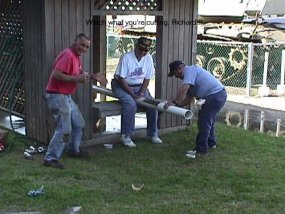 Doc, John, Richard Jenke, Zeb, and Dave all worked on digging 70 feet of old sewer pipe up and replacing it with new heavy duty 4" pipe in addition to connecting the water to the Stewart. It took a concentrated effort, but by the time the afternoon was over, the connections were made and all the trenches were filled in. Doc and Dave did some preliminary work in restoring water to the Stewart and found a few leaks and have a few more valves to open. It does look really promising to get hot showers. [Note-----Christening the commode is saved for Doc Beeghly!!!] We did find evidence that the water line running from the guard gate (the source) to the Stewart may have a break in it somewhere around the gangway to the Stewart. After we had had the water turned on for a few hours, we noticed water forming puddles in the grass and the volume of the water increased over the afternoon. We turned off the water at the source before we left and will work on it tomorrow along with restoring more water services inside the Stewart and locating any leaks that might occur as a result. All in all, we are a bunch of tired old sailors tonight, but we got a lot done! Thanks to all of you who helped! Once again, the usual suspects gathered under gray skies to move Cavalla another increment towards a successful restoration. First and foremost, we put up the new Cavalla gangway brow, donated by Gil Rayor of Raynor & Associates. No longer will visitors leave Seawolf Park unsure if the name of the boat they toured, or why it has been placed there. It looks great--several tourists commented on it. Thanks, Gil! John Barnes concentrated on polishing the torpedo room brass. When the opportunity arose, he gave tours and answered questions to the many visitors of the boat. By observing the visitors when John is explaining the history and workings of the boat, it is apparent how valuable and appreciated this service is. Chris worked on the signal ejectors. They have multiple layers of corrosion and tarnish. He was very helpful with the tourists. Dave installed numerous freshly sanded and painted gauges with new Plexiglas in maneuvering. They looked great. He buttoned up the "Christmas tree" in control. He and Doc dug up the freshwater line to the Stewart, found the isolation valve and pressurized the line to clean it out. Dave clean up the "sticks" in upper level. Wes replaced the bar on the port side switchboard in Maneuvering. Herb cleaned up the trash between the upper deck and the pressure hull that was visible from the visitor's walks. He also installed the newly polished phone cradle (polished by Dave Stoops) and removed one more for polishing. He was pulled away several times to answer visitor questions and help explain the boat. Neal scrubbed the ceramic tile floor in the control room, gave tours, polished a little brass with John, and discovered the missing wardroom seat back was laying on top of the seat bottom--cleaned and repositioned it. Jim Flanders cut a bunch of meter face glasses with his scroll saw which Dave took home to install in the faces. has the wardroom table almost finished stripping and sanding and ready for repainting. A lot of work remains but visible progress is being made. Nothing worthwhile is ever easy and as long as folks come out and pitch in, Cavalla will remain on her way back. Special kudos to Jim Flanders for making the 6 hour trek to work; to Dave and Doc who returned Sunday and dug up 70 feet of sewer line to the Stewart; and to John Barnes who has made several unannounced field days on his own. A very successful field day. Robin and Lanny Kirkpatrick drove in from the Dallas area to assist. The crew assembled in Cavalla's mess for doughnuts and coffee. Doc carried out Jim Flanders suggestion that we paint the ship's name on the stern. Since we are anticipating the removal of the turtleback sometime this year (hopefully! ), Doc acquired some 5" white adhesive letter. Looks great. The opening on the bridge that was allowing rainwater into the conning tower was sealed. Dave and Doc engineered an effective and low cast fix that should reduce the water buildup in the pump room. Neal Stevens and Chris Palumbo raked loose paint and dirt from the walls and objects in the after torpedo room. This was followed by scrubbing and cleaning to remove mildew and dirt. Captain Zeb removed all the broken lenses. This was a safety item as well as a restoration item. Herb cleaned out area between conn and control. Colin polished the signal ejector. Lanny and Colin raked and cleaned the area between the barricade and Cavalla. In total, more than four drums of refuse was removed. Dave relamped Stewart gift shop for future use. Robin and Nickie polished brass in the control room including the GDU. Bob Young made a list of gauges, etc and other ER needs for replacement. He is going to supply us with what parts he can along with paint, brushes, masks, etc. Doc took this time to feed his hungry crew. Thanks, Doc! Yesterday was an interesting and productive day. John Barnes, Johnnie Wallace, Doc Beeghly, Joel Staggs (drove over from Slidell, La. ), Jason (I can't remember his last name but is one of Big John's students, and an A ganger recently discharged), Richard Jenke, Jim Flanders were all there to help. Johnnie and John Barnes and Jason worked in the fwd torpedo room and made a noticeable dent in the appearance of the tubes and getting the mud and trash out of the port top tube. Toured the Steward with Joel and Jim and began getting the gift shop set up as a berthing area. (More on this subject later) Got about 9 bunks in the main area set up with chains, etc. and got some bunks set up in another compartment aft of the gift shop. Repaired some lighting fixtures and replaced some fuses to insure good illumination. Need a bunch of 40 watt flourescents and some 90 watt ones. One of the park board supervisors was there and he said he would get me some incandescent bulbs but they won't get us the flourescents, at least the 90 watt ones. These fixtures can probably be removed anyway...there are not that many of them and there is no point in having odd fixtures. Gary Williamson of the Sea Cadets showed up with two other officers and a sea cadet. I gave them a tour of the Stewart and Cavalla and they took copious notes of the facilities. They wondered about berthing capabilities, how soon they could be ready, etc. They were very interested in helping and thought the Sea Cadets could be used to help make the accommodations ready. One of the officers seemed to be pretty interested in finding the sources of some of the water that has caused rust spots on the deck, bulkheads, etc. I'd sure like to get him on our team! Later, Richard Jenke and I found where the water and sewer connections were made to the Stewart. The sewer connection can be easily made up and the piping in the ground is accessible and in good condition. The water connection on the hull is also available but it make take some time to find the supply piping underground and then to find the main valve to it. The stbd a/c unit was examined and found that a 26 volt control relay had bad contacts. I will look into replacing that. We did not check the compressor out on that one. The port a/c compressor unit has a broken copper tube and that must be replaced and recharged. I have a friend that will help us on that if we buy the freon. He also said that the residential freon (I can't keep R12 and R22 straight!) is much cheaper than the automotive freon. We did use the main fan to provide circulation though. I believe it is imperative that we be allowed to do this. If we have people willing to come from out of town to work, it will be a lot easier to get them if we can provide berthing with hot showers. Also, the Sea Cadets evidently are willing to spend an entire weekend there if we have the berthing. opening but still provide the ventilation. There were many tourists that made their way through the boat and the lucky ones availed themselves of John's or Richard's knowledge and experience. we set up our displays. Fire ext. missing from bracket on port side. Emergency light powered, but not sure that the battery works. Emergency light on fwd end of comp. functioning properly. Needs fire extinguisher Couldn't find spot where one may have been installed. Ext. near LORAN by WTD charged, but not in bracket. May be one from back aft. Emergency light by fwd WTD powered, but battery needs to be replaced. Officer country emergency light ok. YES, there is water draining from the stbd lower torpedo tube in the fwd torp. rm. I would guess part of a gallon a minute but do not know if the leak rate is constant. I did hear the sump pump cycle in the morning. Dave fixed a couple of electrical problems....replaced fuse, bulbs, etc. in lighting circuits, collected and washed a bunch of globes and rings for the incandescent fixtures and installed about half a dozen where they were missing. Checked out the shore power incoming breaker....it is 3 phase 110VAC and the phase values were 15, 15, and 25 amps. Did not find the cathodic protection system but did not go on the Stewart where it most likely is located. Dave did some clean up in the aft. torp. room, but even though the trash bag weighed about 20 pounds, it doesn't appear to be much cleaner! I will bring a coffee pot down next time and some coffee and leave it on the boat for field days. If you drink coffee, bring down one of your cups! John Fredricks, Richard Beegley, Dave Stoops, John Barnes, Jim Flanders. John Fredricks and Beegley worked on the after torpedo tubes and some general cleanup of the fenced in area. John Barnes worked in a number of places and was opening the lockers to see if we could find some more spare parts. (We had found a few in the ATR a few weeks earlier. I did some relamping and some electrical work. Identified a few electrical safety concerns. Toured the various compartments on the Stewart to see what needs to be done to berth small groups over the weekend. Also found some discrepancies that will need to be addressed there such as standing water in some of the compartments. (These were behind locked doors so the public does not have access. Jim Flanders worked on getting the radio room cleaned up to some extent and is working on getting the antennas wired to radio. John must have given two or three groups tours. I overheard one of the groups talking (when I was on the Stewart) at how lucky they were to have had John give them the tour. (They did not know I overheard them.) I did open up the hull opening panel and found that it needs some work but because of the nature of the construction and that it is energized I deferred this until later. I talked with Richard Jenke last night and he wants to meet me there on the 20th and look at the lighting fixtures and some of the electrical. Richard was helpful when the Cavalla was put there so I am going to take advantage of his experience. 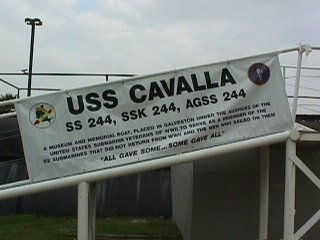 At about 9:00 am this morning, a group of people attacked the USS CAVALLA SS-244 with a full complement of rags, cleaners, buckets, and enthusiasm. Included in this group were Neal Stevens, his dad, Abe Stevens, Neal's two 9 year old daughters Vickie and Valerie, Dave Stoops, Ron Smith, John Barnes and his wife, John McMichael and his wife Billy, John Fredricks, and Wes Meadors. Cleaning attack began in the crews mess and galley and the Steven's clan did a great job, and made some repairs to the tables, and some of the other gear too. John Fredricks and John Barnes made tours through the accessible compartments taking notes on what needed to be done to bring the compartments up to snuff. Work then moved to the control room, where minor repairs were made, including securing the chart table. It appeared to be overwhelming at first. But I think when we get a chance to compile all of the notes on what needs to be taken care of, it will not be so foreboding. It was a fun day, and we appreciate John McMichael coming all the way from Arlington, TX to help out. We have a lot of work to do, not only in restoring Cavalla, but getting programs in order to restoring her as an attraction worth visiting and the attendant publicity that is therefore required. Thanks one and all for your help! Here's a list of people currently engaged in Cavalla Preservation tasks. If I missed someone or have an error, please let me know so I can change it.